A copy of Anais Nin’s birth certificate. Interestingly, Rosa’s age is incorrect: she was in fact 31 at this time. Whether this is a clerical error or whether Joaquín and/or Rosa wanted to keep their age difference a secret is pure speculation. According to Nin biographer Deirdre Bair, Joaquín was not pleased at having a child so early on in his marriage and, perhaps more importantly, his career. He became jealous of the attention Rosa gave her delicate daughter. This seemed to interfere with the performance relationship the couple had…at first Joaquín insisted Rosa perform with him in order to get her away from Anaïs, and then, irrationally, insisted she not perform when he felt Rosa was neglecting both him and Anaïs. From that point forward, Joaquín Nin became a solo performer and Rosa was reduced to a mother who sat in the audience to cheer him. By the time Anaïs’s brother, Thorvald, was born in Havana in 1905, she was afflicted with typhoid fever, becoming violently ill. Joaquín was repulsed by the sight of his now very thin, sickly daughter and made sure she knew how ugly he found her. By the time Anaïs’s youngest brother, Joaquín, was born in Berlin, the family life had deteriorated to the point of chaos and violence. Beatings were brutal and often, at the hand of the father. The violence between Joaquín Sr. and Rosa intensified to the point where Anaïs feared for her mother’s life (see the introduction to “Prelude to a Symphony—Letters between a father and daughter,” A Café in Space, Vol. 6). By 1913, the family as Anaïs knew it was destroyed when her father abandoned them, and for the rest of her life she would be torn by the loss. If you have thoughts to share on this day, Anaïs Nin’s 107th birthday, leave a comment or visit our guestbook. To read more about Nin’s birthplace, get Britt Arenander’s Anais Nin’s Lost World: Paris in Words and Pictures, 1924-1939, which has descriptions and an interactive map that includes the house. Myth #4: Anaïs Nin was fluent in three languages: French, Spanish, and English. Fact: When Anaïs Nin’s father, Joaquín Nin, abandoned his family in Arachon, France, in 1913, she, her mother and her two younger brothers went to Barcelona and stayed with Joaquín’s parents. During the year or so they spent in Spain, Anaïs learned her Spanish. When the fatherless family arrived in New York in 1914, French was the spoken language at home. Although Anaïs’s mother, Rosa, was fluent in English (as well as Spanish and French), she had determined the family’s “mother tongue” was French. 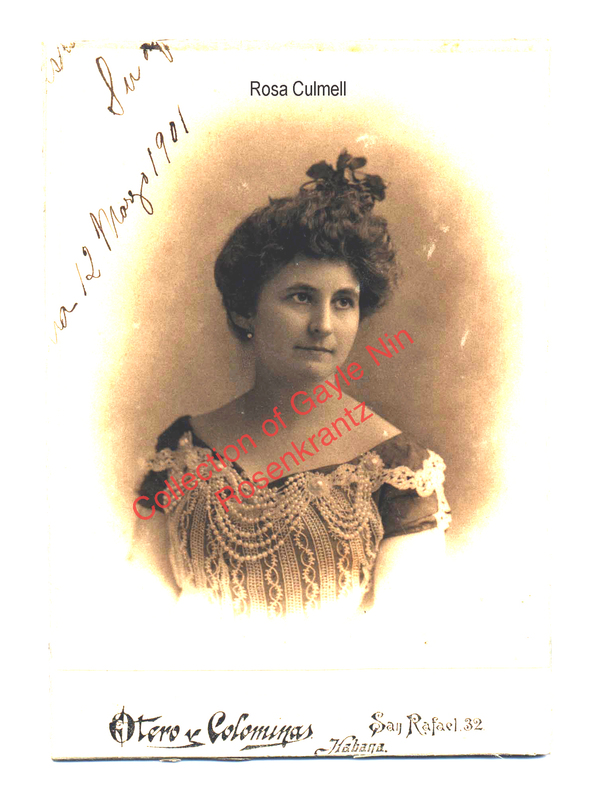 Her philosophy was that since her children would learn English soon enough in school and in their social interactions, and that Spanish would be spoken with their Cuban relatives, the only way to keep the French alive was to speak it exclusively at home. When Anaïs began her diary on the trip to America, it was in French. Although her English was improving over the next few years, Nin continued her diary writing in French, partly because she longed to retain her identity, and partly because she intended the diary as a long “letter” to her estranged father, who did not know English. As her English grew, her French withered. Her father chastised her for her misuse of words and accent marks, leading Anaïs to close one of her letters with all the accent marks at the end: “Put them where they belong,” she told him. Sometimes Anaïs would transcribe letters to English-speaking friends into her diary, and it was clear that she was better able to express herself with English. She began reading the English-language classics, and by 1920 had switched her diary to English. Her English was by far a better vehicle for her self-expression, but was still a work-in-progress, and would be for years to come. 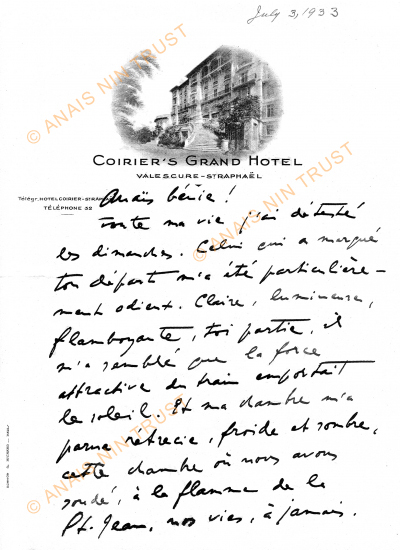 As Anaïs began to attempt to write fiction in English after returning to Paris in 1925, her young husband, Hugh Guiler, in the name of helping her, criticized her incorrect (as he saw it) use of words, or the use of words that were considered archaic or odd. Later on, Henry Miller would do much the same (see Myth #2). At times, Nin felt hopeless—she had Guiler and Miller criticizing her English, and she admitted to Miller that writing in French to her father was “like trying to create a river with twigs” (see “Prelude to a Symphony: letters between a father and daughter,” A Café in Space, Vol. 6). Her Spanish at this time was almost non-existent…her father occasionally wrote to her in Spanish, but Anaïs did not respond in kind. As Nin developed artistically through these trials by fire, her writing became stronger, more economic, and possessed an exotically distinct quality. It is often described as “English written in the French style.” There is no question that Anaïs Nin became one of the most eloquent writers in the English language, and to this day one of the most oft-quoted…but during the transitions between her three languages, arguably caused by her constant resettling, she was fluent in none of them. 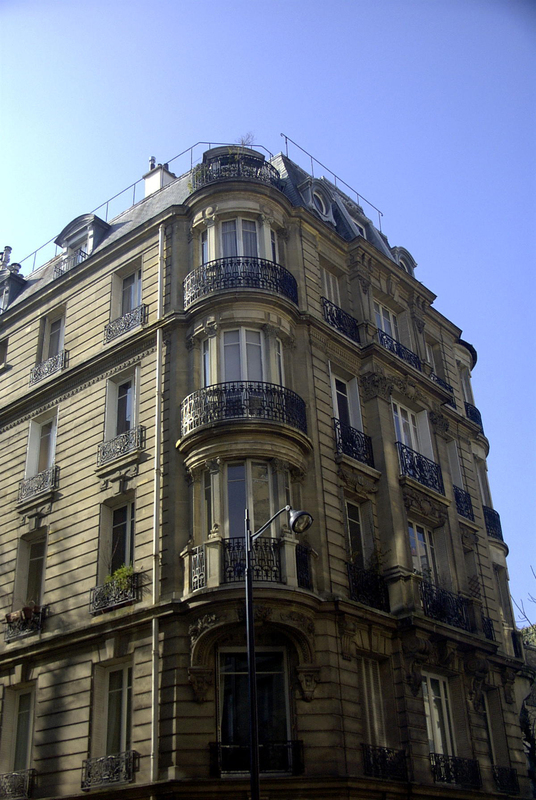 Shortly before Anaïs Nin’s birth on February 21, 1903, Joaquín Nin and his wife, Rosa, moved to the plush Paris suburb of Neuilly-sur-Seine and took a flat at 7 rue du Général Henrion Bertier, a short walk from what is now avenue Charles de Gaulle, from where one can see the Arc de Triomphe in the distance to the east. Today, the neighborhood is overshadowed by the futuristic silhouette of La Défense and is choked with cars parked where there is no space, but at the turn of the 20th century it could have been the setting for a passage from Proust’s À la recherche du temps perdu. There would have been well-dressed couples strolling on the trottoir, elegant carriages coming up and down the narrow street, the well-heeled horseriding in the nearby Bois du Bologne. For Joaquín Nin, whose musical career was just beginning, it was the perfect place for his upper-crust tastes. For Rosa, it was a source of strain because it was very expensive and it was her father supplying the funds. The family didn’t spend much time in Neuilly; they traveled back to Havana in 1904 where Joaquín took Cuban citizenship and shortly thereafter performed in Paris for the first time as a Cuban. Rosa was by then pregnant with their second child, Thorvald, who was born in 1905 in Havana. Rosa’s father, Thorvald Culmell, was dying and sought to tighten the spending. So, after returning to France, the Nin family moved from Neuilly to a less expensive house in St-Cloud, outside of Paris. 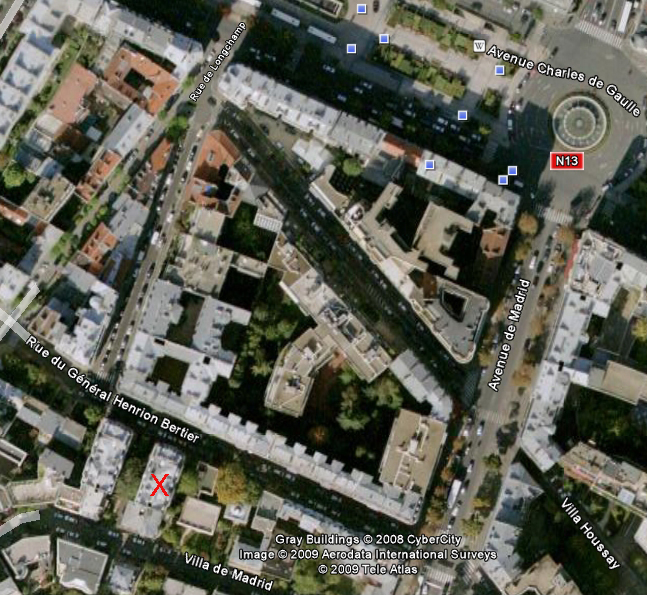 For an article on Neuilly, see A Cafe in Space, Vol. 1. To read more about Neuilly, get Britt Arenander’s Anais Nin’s Lost World: Paris in Words and Pictures, 1924-1939, which has descriptions and an interactive map that includes the house. Here are some details about Anaïs Nin’s Spanish and Cuban relatives. Again, many thanks to Gayle Nin Rosenkrantz, who has cleared up some misinformation and supplied the photo. 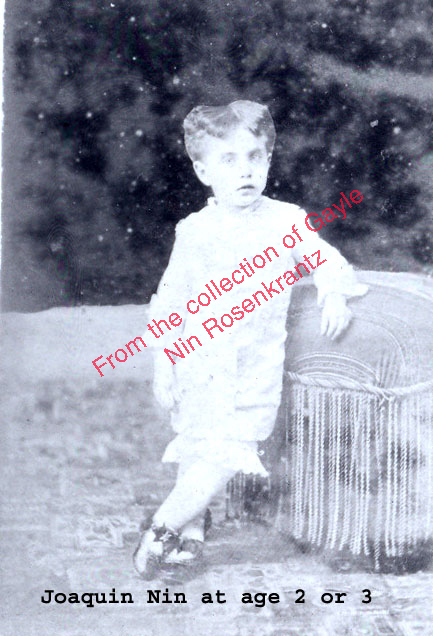 Anaïs Nin’s Spanish grandfather, Joaquín Nin y Tudo, was a military officer stationed in Cuba, and her grandmother, Angela Castellanos y Perdomo, was Cuban by birth. Their son José Joaquín Nin y Castellanos, Anaïs Nin’s father, was born in Cuba on September 29, 1879. 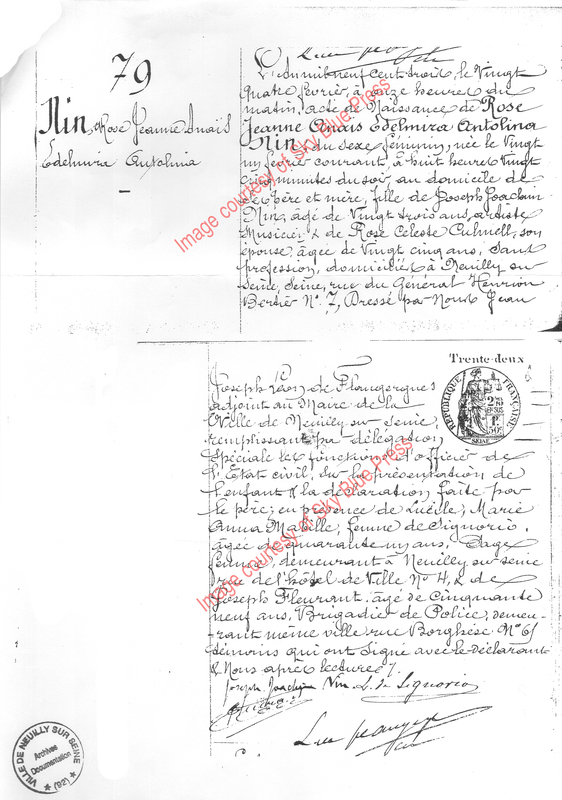 Perhaps because being born Cuban was something of a detriment in the eyes of Spanish nobility, Joaquín Nin y Castellanos was baptized in Spain a year after his birth. Since his father decided to stay in Barcelona, Joaquín spent most of his first 21 years there. Although it has been said that he looked down upon his Cuban relatives, referring to them as “peasants,” his Cuban relatives were by far wealthier than the Nins and were also very proud of their heritage. Moreover, when Cuba gained its independence, Joaquín opted for Cuban citizenship. Joaquín had a natural ability at the piano, studied in Barcelona and gave his first performance there as a teenager. He gave piano lessons, and he apparently seduced one of his female students, whose father threatened him bodily harm. Joaquín fled Spain and set out for Cuba in 1901. According to Deirdre Bair, Anaïs Nin’s biographer, the reason he dropped the “Castellanos” from his name was to distance himself from the disgrace he’d incurred. However, this doesn’t seem to make sense since it was a Nin, not a Castellanos, who got the young girl into trouble. 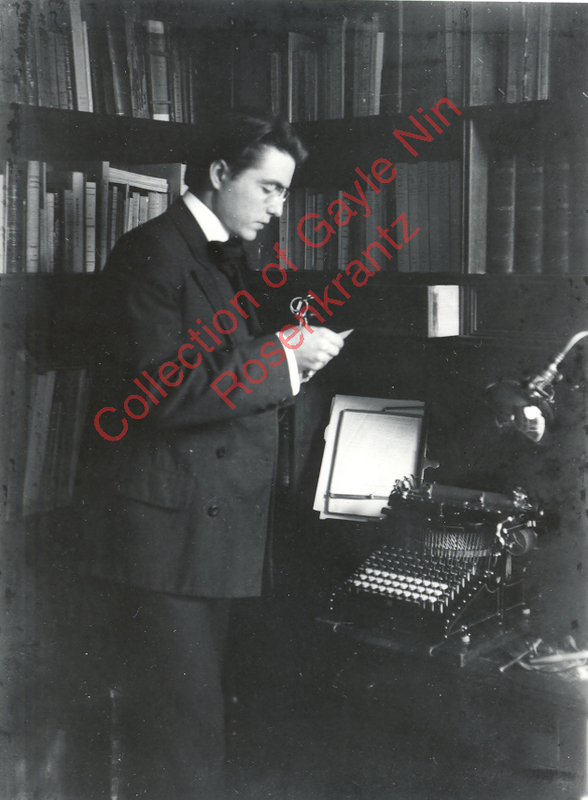 Joaquín Nin’s son, Thorvald, said that his father wanted to keep things simple, so he also dropped the first name, José, and was professionally known as Joaquín Nin from that point on. Another reason to believe that Joaquín valued his Cuban heritage was the fact that it was the Castellanos family who took him in and supported him after fleeing Spain. Joaquín Nin thought very highly of his father, and dedicated his first performance in Barcelona to him. In 1933, when Joaquín began reacquainting himself with Anaïs after a twenty year estrangement, memories of his father filled his letters to her (a sample of these letters can be read in A Cafe in Space, Vol. 6). However, Anaïs’s memories of her Spanish grandfather were less glowing: she thought him to be a terrifying tyrant. On the other hand, Anaïs remembered her grandmother, Angela, as sweet and kind…in fact, all of the Nin family remembered her that way.